One of the reason I wanted to go ahead and try to finish up my charity quilts was to free my mind for some family and friends quilts - ones that I just want to do to give to people around me - people I know - and possibly people who need encouragement, or "just because". A friend of mine, Ela, has been sick for a month. She has been discouraged about being so sick. 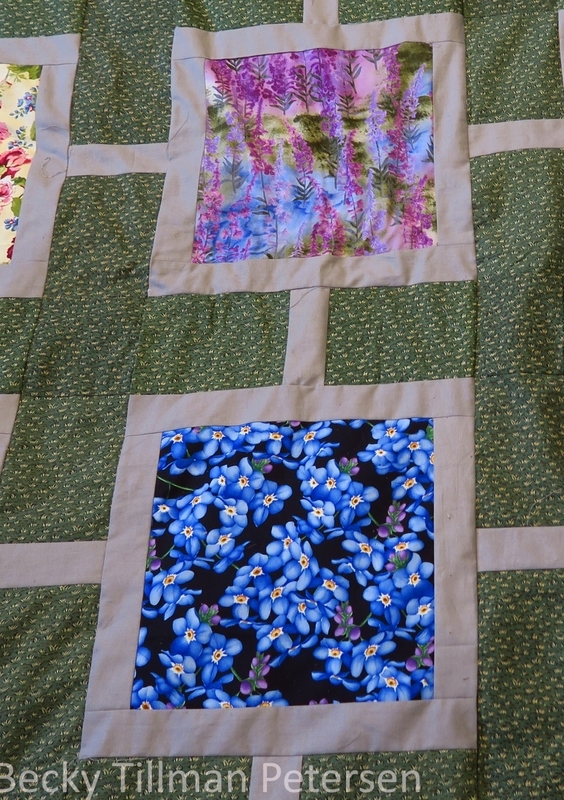 I decided in the last few days that I wanted to make her a quilt she could have - she lives just down the street from us. 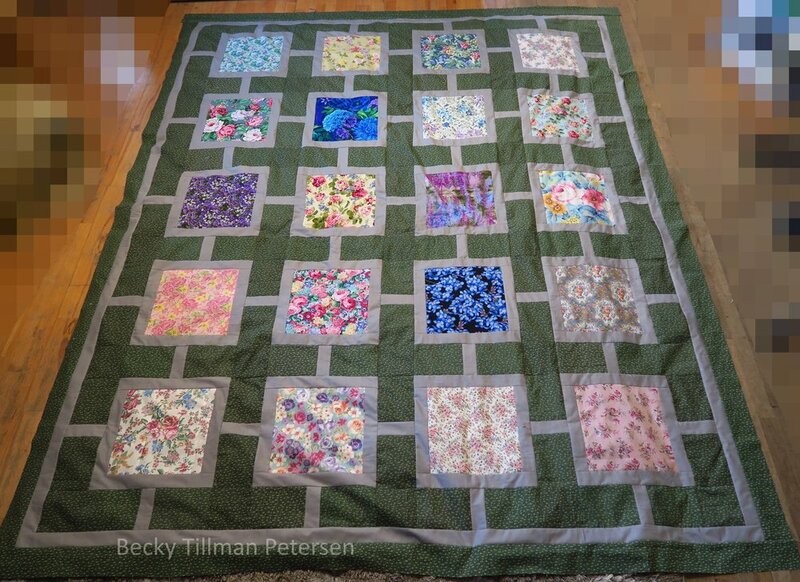 Since she absolutely adores working in her garden, I thought I'd make it using some of my really pretty floral fabrics. I thought of just leaving the squares big and making what looks like a path around the flowerbeds. I checked out my rock fabric, but I don't have enough of that rock fabric to use in this - so I decided to use plain gray and do pebbles in the gray when I quilt - to make it look like a path. 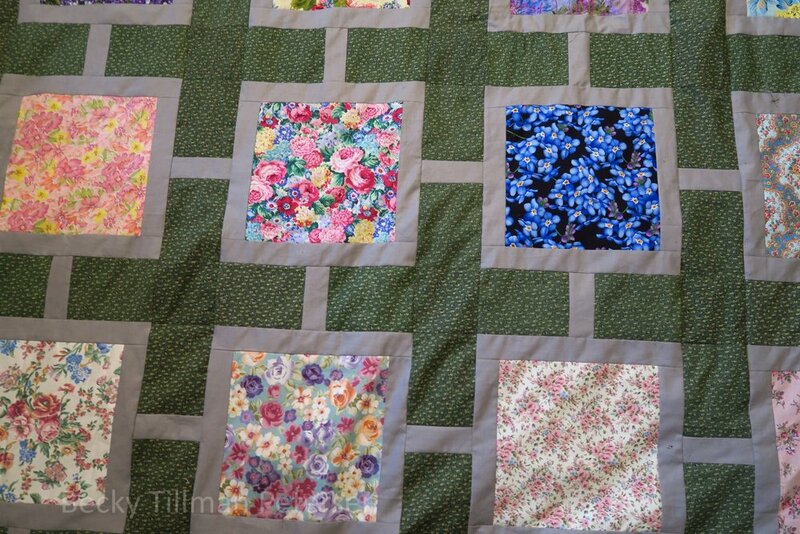 I did have enough green, though, to put in the grass - so this quilt is super simple. This will be one of my "Easy Block" series - a series that I started last year - because sometimes you just want to leave the squares big. Sometimes the fabrics need to be large pieces in order to appreciate the colors or design. I did use some of my very special Alaska fabrics because here in Poland we have forget-me-nots and also "Fireweed" here - so I took two of my Alaskan fabrics and am using them here. Ela sews, so I know she will appreciate this quilt. Just writing about this top is making me excited to get it completely finished. I am using a Polish folk fabric as the backing. I'm also planning on appliqueing some butterflies or ladybugs after I quilt it. I found some at the "findings" store - they are made of felt, and I'm curious how they will be when i finish the quilt. Am eager to get on to it. I hope to finish this one right away. The gray represents the garden paths and I hope to pebble these when I quilt it. I know it's super simple, but I did write up the pattern just in case some of you want to make something similar. Don't forget to check out what my sis has for you in the shop!